Lately my couch cushions have been bothering me. I never really liked them... they came with the couch and I bought plain red ones from Pier One to use instead and didn't like those so I gave up and used the ones I had. And they are fine... they just aren't "me." They are itchy, geometric, and bland. As a reminder, here they are - these pillows are in my living room and den because the couch and loveseat are in seperate rooms. I am not limited to having the same pillows in both rooms but would probably want to do so for continuity. But then again, I'm working with two different vibes and color palates. Wal-mart must have had some great marketing recently because the first place I thought to look was Wal-mart's website (probably because of their super cute ad in Real Simple and US Weekly with the pillows in different slipper chairs). I could probably buy two brown textured ones and use this one as the third odd one for an ununiformity look. And, in scrolling even further, I found these for the den! Looking at them together, though... might get a little too polka dot-y, even for me. Moving on, I went on over to Target's website. The first thing that caught my eye was this little guy - can I tell you how into owls I am right now? 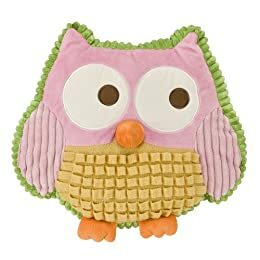 All of these pillows so far have been practical in price. And now, for the impractical. 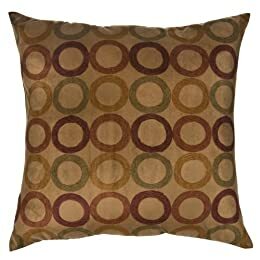 How about this pillow made out of buttons from Pier One? So who knows if I'll be able to indulge in some new pillows any time soon, what with the laundry project and kitchen project tying up the funds. But there are some great options out there and you don't have to pay a ton to get cute throw pillows! 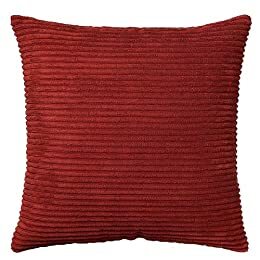 ps - I didn't mention any of these because they aren't on the web but Big Lots and TJ Maxx also usually have great throw pillows.